The majority of people don’t consume dashboards, yet that’s been the only way the industry has been delivering data to business users. So, our product roadmap looks beyond the dashboard and focuses on how we can deliver data to users in a way that’s meaningful to them. To achieve this, we’re focusing on three fundamental areas - automation, mobile, and interpretation. When some vendors are talking about automation, they’re focusing on things like data preparation. At Yellowfin, we’re using automation to improve how we can deliver insights to business users as they happen. We already have Assisted Insights and Signals that discover insights automatically and deliver them to users. We’re now looking at how we can expand the different types of Signals and Automated Insights that we offer to organizations. Mobile is the second area we’re focused on. Everyone has a multitude of micro-moments on their phones every day. We want to take advantage of those micro-moments and deliver data insights seamlessly across mobile devices as they happen. That’s why we’re reimagining our mobile application. Rather than just replicating our dashboard on a mobile phone, we’re thinking about what people do in those micro-moments and how they use their phone to communicate. As a result, we’re creating a mobile app that’s completely different from anything else in the industry. Our third area of focus is around interpretation. We’re looking at how to take data in its raw form and package it up in a way that’s meaningful for business users. A new version of our dashboard that people can actually interact with is just one part of this. We’re also looking at the different ways people consume content and will be giving them the opportunity to consume data in a broader range of forms. Traditionally, the industry has thought about analytics in terms of charts and tables rather than content. By thinking about analytics as more than just a set of numbers or metrics, it’s opened up a whole range of new ways in which that content can be delivered - video, narrative, voice, or even live presentations. We’re committed to pushing the boundaries and thinking about how to help people create, automate, and deliver data content in a range of ways. This will allow business people to add their own contextual knowledge to changes in their data and enable them to share that knowledge more broadly. To achieve this, we’re extrapolating on Stories and our dashboards and looking at new ways that people can package up insights and deliver that to their organization. These type of changes are long overdue. As an industry, we’ve been pushing the dashboard paradigm for over 30 years and nothing has changed. It’s time for the industry to think of better ways for business users to access and deliver content so they can make decisions. 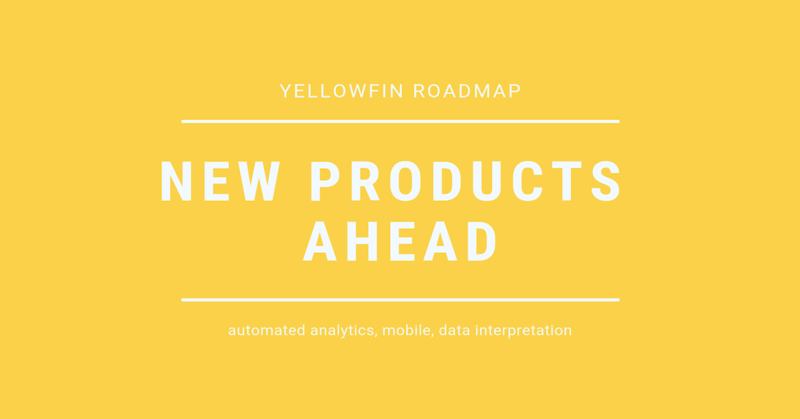 As an innovator in the industry, we believe these new products will continue to differentiate Yellowfin and add value to our customers. These changes are all part of an ongoing process of innovation that will be rolled out over the course of the year. The beta of our new mobile application will be available in May, and the new dashboard and presentation modules will be available later in the year. Find out how automation is completely changing how your analytics team needs to be structured to stay future-proof. Download the paper.